I’m so glad I made the choice to sign up for a real swim class even if I wont be finishing it. I’ve learned so much in the last two weeks that I’d never even thought of before. I also realized how important it is to learn the basics! One of the first things my teacher had me do was buy a few text books to read as references. Nothing expensive, I found them all on Amazon and ebay for less that $15 each. She also made sure I had a list of equipment I needed to keep on hand to practice some drills. Some of this equipment I already owned but there were some pieces that I hadn’t purchased because I didn’t think I needed them. Those pieces turned out to be the most important. So we all know the bare essentials swimsuit, goggles, swim cap (if you prefer). These items should go without saying. One thing I never knew before was that goggles actually come in different sizes and different fits! I may be revealing how much of newbie I truly am, but I don’t care! 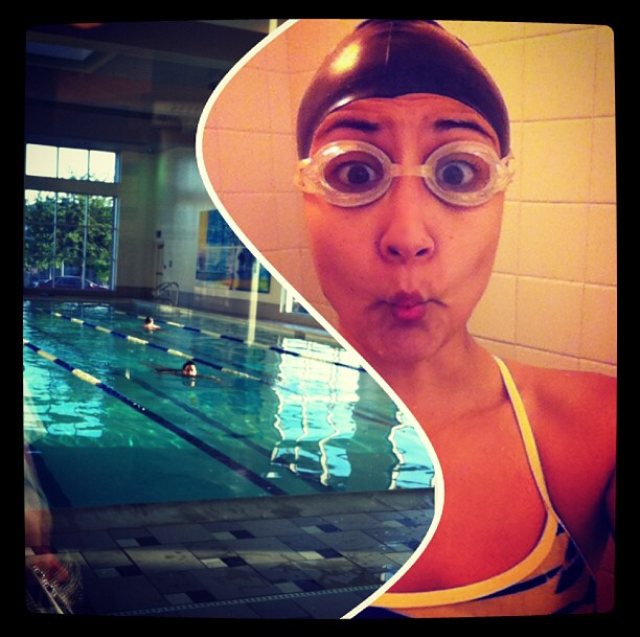 If I can save someone from wearing kiddie goggles like I did for about a year, then so be it! I never understood why mine always leaked and practically sucked my eyeballs out of their sockets. If your shopping for goggles, ask a sales rep at your local sporting goods store. They can help find a pair that fit you best. 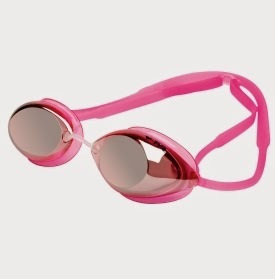 I have since upgraded to a pretty pink pair of tinted TYR goggles that I just adore. I may be purchasing a second pair that fit around the outer eye rather than the inner eye like these. They tend to hurt a bit around the bone when I do my longer workouts. 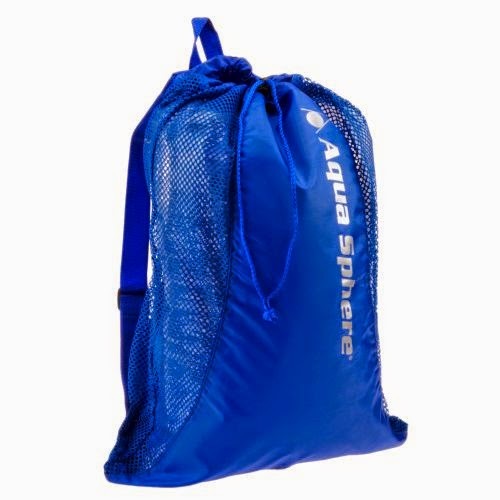 I also purchased one of these nifty mesh bags to carry all my goodies in. (Not an essential) but I was carrying them in a large pool tote previously and after a while, I started to notice a little odor coming from the bag. Eeeeek! I can easily toss this one in the wash any time I need and it air dries quickly. 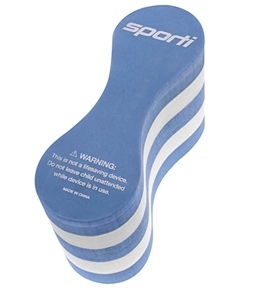 This is one of my favorite pieces of equipment mainly because I can work on my kick drills without drowning. I actually purchased a children’s kickboard (on purpose) because my torso is a little short and the adult kickboards got in my way when I did drills on my back. …..or in the supine position for you fancy folks! Pull Buoy…get one! When I first started working on my form I found this little guy the MOST helpful. You hold it between your thighs and it keeps your legs together for a better kick. I also love it because…..I’m a sinker. I have very little float from the waste down and it’s a constant battle to stay level in the water. On days that I really wanted to work on my stroke technique I could use this buoy to keep me up and really focus on my form. 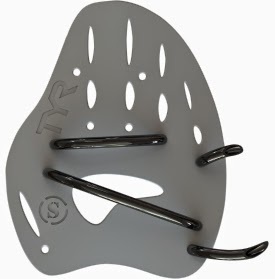 This is a recent purchase for me and I’m still getting the feel for paddles. First impression, love them! When I first heard, you want to “pull” the water with your hand I was like….errrr huh?! I never understood the “feeling” of the water. What I love about these paddles is that I can FEEL myself pulling back on the water. Meaning there is pressure on my hand. The more pressure I feel, the faster I go. When I do drills with the paddles I have much higher sense of feel for the water after I take them off. I’m looking for the pressure on my hands. Who-da-thunk you could pull water? ha! 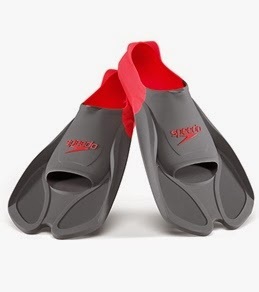 Fins are great for us lower body sinkers! I find that if I add fins to my warm ups not only do get a better warm up but they actually improve my body position later in my workout. Again, this goes back to “feeling” the water and body position. If I warm up with fins I can find my proper position and will later be able to tell when I’m sinking or when I’m not level. also, I have a really weak kick. (something I never knew!) My form is ok but I really need to work on my strength, fins to the rescue! The #1 reason I’m suggesting this…heart rate. I’m still building strength in my arms and legs. My goal is distance and when I get tired in the water, I need to BREATHE! My heart rate spikes, I’m breathing every stroke and before I know it I’m hanging off the edge of the pool panting. I hate it. 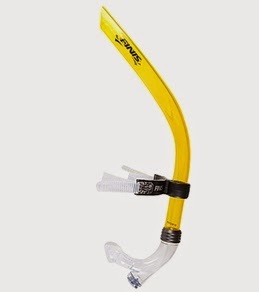 Using a snorkel helps me work on my endurance and strength without the worry of suffocation. 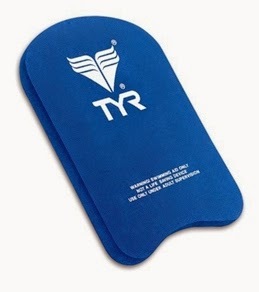 I don’t use it all the time but If I really want to put in the laps, it sure does help. So there you have it! My swim essentials. I’m sure there are more I still have not heard of but for now, this is what I need and they all serve me well. I think I have finally graduated from sinking rock to tadpole. Woo Hoo! NextSomething happened to my legs….I killed them! You might be a triathlete when….